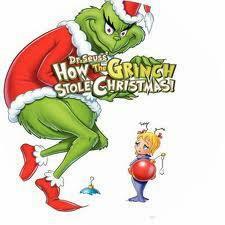 Dr. Seuss' How the Grinch Stole Christmas: He's a Mean One, All Right! 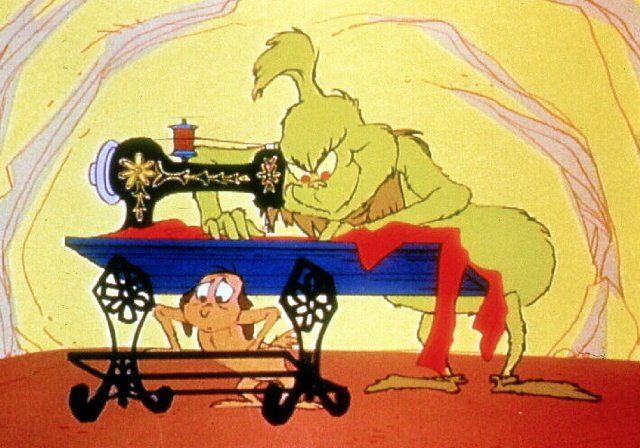 If there has been one certainty during every holiday season since the mid-1960s, it is that "How the Grinch Stole Christmas" (1966) will get an airing. There are people around the country and, indeed, the world who can tell you the first time they saw this marvel ten, twenty, thirty, or forty years ago. Something like that becomes part of your childhood, even your family. The fact that it still exists, and is still happening today, provides a link with the past that is transcendent. You may not watch "Grinch" every year, but just knowing that it is on somewhere, sometime during the holiday season gives it an extra resonance, a shared experience not just across states and countries, but across time as well.. It's great how Max helps out! Chuck Jones had a long, honored career in animation. Some of the great characters, such as the Roadrunner, are his creation. Once, as he put it, he "learned how to be funny," it was time for the rest of the industry to watch out. Getting Max's antlers just right! Chuck developed this special with Theodor Geisel, aka Dr. Seuss. It wasn't anything special, just one of many things they were going to work on. There were several keys to turning it from a one-shot showing to an annual tradition. First, it had to have some humor. Jones had learned the hard way that only Walt Disney could somehow get away with animation that wasn't funny. Not a naturally funny man, Jones worked and worked and worked on it. Gradually, it came together, with animated characters Marvin the Martian and Pepe LePew arising from his brainstorms. He used this skill in "Grinch," making the poor dog Max the representation of all that was wrong with The Grinch, pulling an overloaded sleigh and wearing degrading antlers. Another key was getting the drawings right. Fortunately, he had help in that area. After being fired from Warner Bros. for moonlighting on a feature film, he had left and brought most of the department with him. Outside of Disney Animation, he had the best staff of drawers in the business. The story part was easy: they would just use Dr. Seuss' book and adapt it slightly. The book had been dichromatic, in reds and black. A network show would need color, which had become standard in the industry just the previous year. That was easy to do. Beef up the character of Max the dog for comic effect, throw in a few songs, and they were good to go. An excited little girl, looking for her presents! But what will she find? The most important ingredient, though, was the voice. Who would voice The Grinch and narrate? They couldn't get just anyone if they wanted to sell this project. 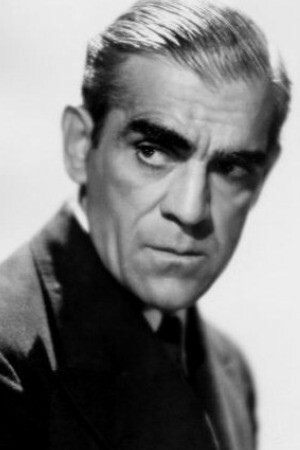 Someone suggested Boris Karloff, but Geisel was hesitant - he really didn't think Karloff had the voice for it. 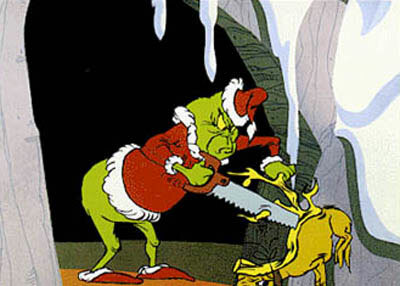 A deal was struck to mechanically alter Karloff's voice when he voiced the character of The Grinch. Contrary to what many people think, Boris Karloff did not sing the classic "You're a Mean One, Mr. Grinch" - that was the under-appreciated veteran voice talent Thurl Ravenscroft, who managed to sound awfully like Boris Karloff. With everything in place, they got a production company together to do the film, Cat in the Hat Productions, and with backing from MGM were ready to go. With minor changes to accomodate the format, the plot remained true to the book. 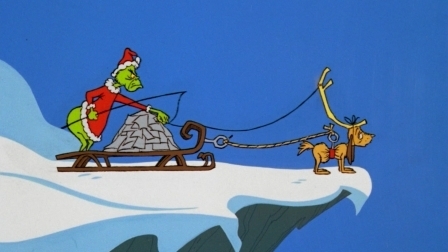 The Grinch (Karloff) lives in a cave atop Mount Crumpit, far above Whoville. The Grinch is alone up there, and he resents the people of Whoville far below. He especially hates Christmas because it makes everyone so happy. 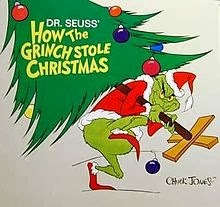 The story is set on Christmas Eve, when Mr. Grinch decides to ruin Christmas for everyone by stealing all the presents. The Grinch is busted! Or is he? 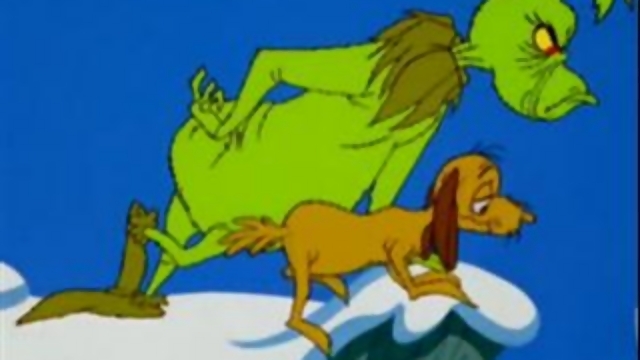 Disguising Max as a reindeer, Mr. Grinch fills his giant sleigh with empty bags and forces Max to pull him to Whovile. He has a fright when an innocent little girl, Cindy Lou Who (June Foray), awakens and asks him why he's taking all the Christmas trees. He replies that he is just going to repair them, and she goes back to bed. He continues stealing everything he can get his hands on. Having returned to his mountain lair, he prepares to destroy all of the presents. 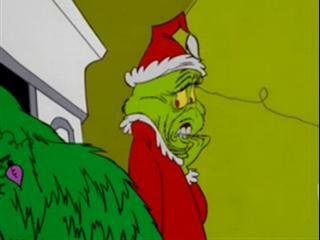 He hears singing from Whoville, though, and realizes that he hasn't ruined Christmas at all, because it isn't about presents at all. Suddenly understanding where he has gone wrong, Mr. Grinch rushes over to save the sled. 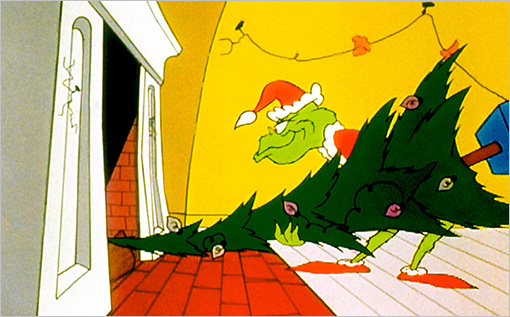 The show was somewhat similar to 1964's "Rudolf the Red-Nosed Reindeer," but that was stop-motion, while "Grinch" was pure hand-drawn animation. It now is one of only four Christmas specials from the 1960s that still airs every year over one of the networks, the others being "Rudolph," "Frosty the Snowman" and "A Charlie Brown Christmas." Look at Max hanging on for dear life! 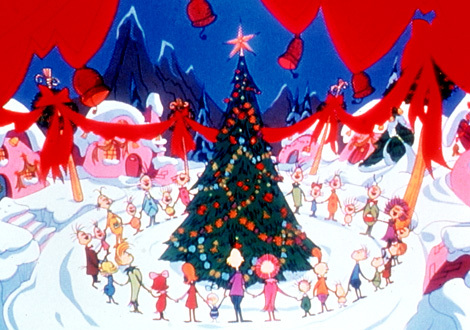 The animation stands up today, with vibrant colors and distinctive drawings for Grinch and Max. For many people, Max is the most memorable part of the entire special, with his obvious discomfort at being forced to wear enormous antlers that don't do a thing to disguise who he really is. That he is over-worked just shows how mean Mr. Grinch is at heart. 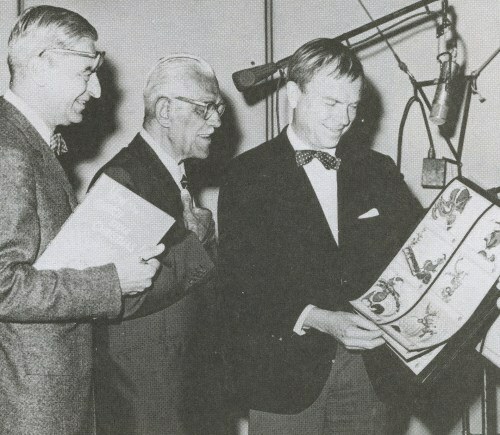 Dr. Seuss, Boris Karloff and Chuck Jones work on "Grinch"
"You're a Mean One, Mr. Grinch" is performed by Thurl Ravenscroft, whose baritone sounds remarkably like Boris Karloff. It quickly became a seasonal classic that still gets radio play. The narration by Karloff is just right. He wasn't well when he recorded his part and died a few years later, but he pulled this off brilliantly. 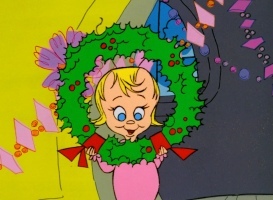 The character of the little girl, who give Mr. Grinch such a fright, is the true heart of the story and gives it an extra punch of good confronting evil. "The Grinch Who Stole Christmas" continues to be shown every year. In 2012, it appeared on ABC right after Thanksgiving and drew its usual stellar ratings. 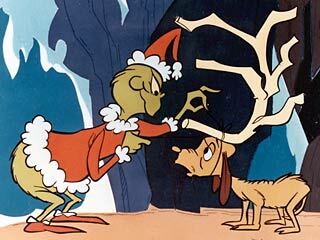 Chuck Jones learned his lessons well, and there is no sign of the Grinch being retired any time soon. Below is a key section from near the original ending of the classic 1966 film. Enjoy! Below is the original version of "You're a Mean One, Mr. Grinch." The lyrics were written by Theodor "Dr. Seuss" Geisel, the music was composed by Albert Hague, and the song was performed by Thurl Ravenscroft.